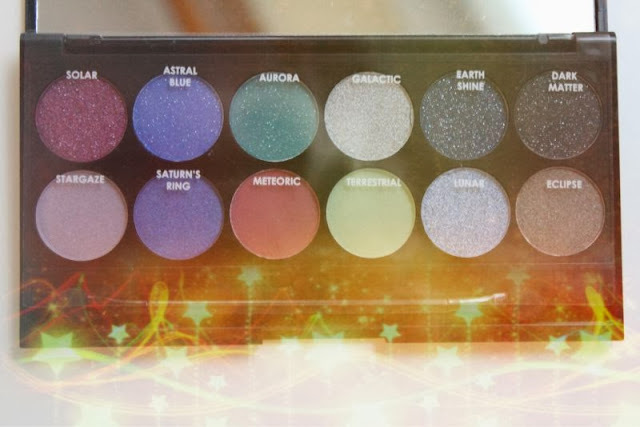 Just in time for Christmas (I'm sure the launch date is November the 4th) is the Sleek Make-Up Celestial Palette which contains all the glitter and festive shades you could ever need to see you through the party season and beyond! 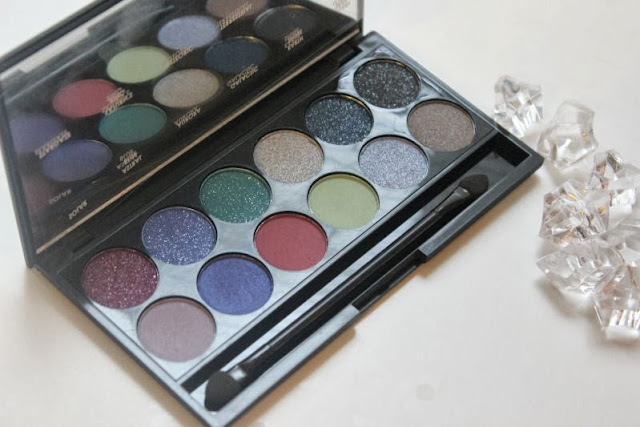 Much like previous Sleek Make-Up Palette's this contains 12 shades and to the best of my knowledge they are all new shades, I could be wrong as the brand do have a tendency to release similar shades every now and then so do feel free to correct me in the comments. This time around the new Sleek offering only contains two true matte eyeshadows with the rest being metallic or glitter in finish. Typically speaking I do find Sleek Make-Up to excel at shimmer/metallic finishes but not so much when it comes to matte formula's, I find them to be dry, chalky and produce a substantial amount of fall out. 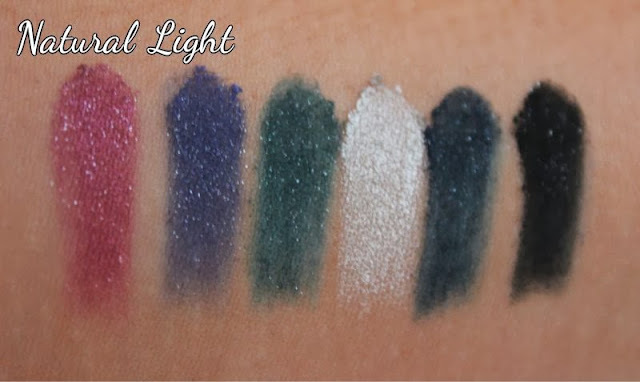 That being said I can not dispute that all of Sleek Make-Up's eyeshadows are well pigmented and with a primer then do stay in place all day. Solar - Not an outright dupe for MAC Cranberry given that it is a glitter polish but close enough. Great pigmentation and despite the glitter it is not overly dry nor gritty in texture. Astral Blue - Matte cornflower base with lots of teeny tiny silver glitter speckles, a little dry in texture but no faults in terms of colour pay off. Aurora - Mid toned matte green base with lots of silver glitter, much like above a little dry but good colour pay off. Galactic - A slightly blue based metallic silver that has a butter soft texture and great pigmentation. 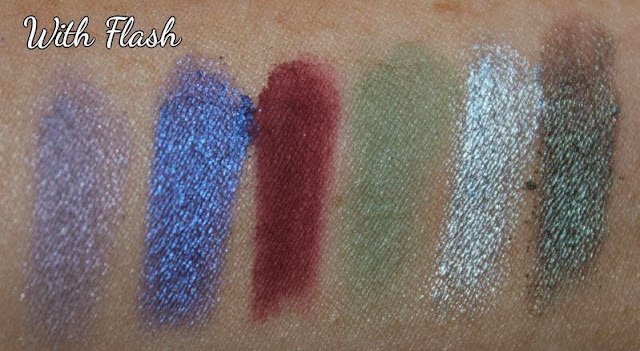 Earth Shine - Another glitter based shade this time around it is a matte navy base that performs much like the other glitter shades. As this has a dark base the glitter is more obvious and striking when worn. Dark Matter - Another close match to a MAC eyeshadow shade and this time around it is some what similar to MAC's Black Tied. Much like Earth Shine the glitter is more obvious due to the dark almost black base - in the natural light the glitter almost "dances". Stargaze - An almost matte mauve based lilac, slightly softer than the other matte shades with good colour pay off. Saturn's Ring - A duo chrome deep velvet purple shade that can appear reflect either purple, pink or blue in certain lights. Again not quite a matte but great pigmentation with a somewhat soft texture. Meteoric - A matte deep crimson hue, not quite pink not quite red. Despite being a matte shade this is not at all chalky and had minimal fall out. Terrestrial - A soft apple green matte shade that much like above is not at all chalky but is fairly weak in terms of colour pay off and not as prone to product fall out as older Sleek matte eyeshadows. Lunar - In my opinion the stand out shade, a bizarre light silver lilac that in some lights appears baby blue. It truly is different to anything else I own and thanks to the metallic texture a dream to work with. Easy to blend, good pigmentation and a butter soft texture. 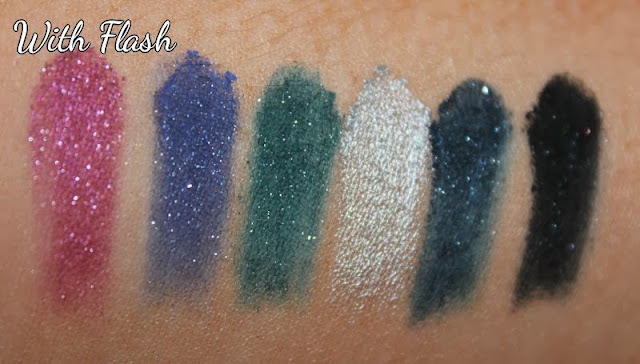 Eclipse - Another soft textured metallic hue which could be compared to MAC Club eyeshadow. A green based brown that reflects more green in the natural light. 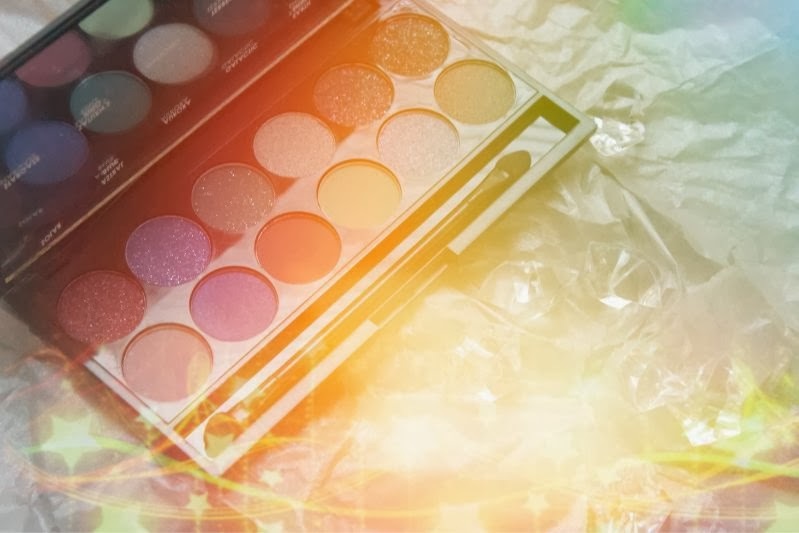 The Sleek Make-Up Celestial Palette * is a hit in my book with a great variety of shades and formulas that allow you to create both day and night looks. This should launch from all the usual Sleek Make-Up outlets (Superdrug and online) on the 4th of November for £7.99. * PR sample sent for consideration of review. So excited by thus, I love a Sleek Palette! All these shades look lovely, especially Meteoric! All these colours are gorgeous and so suitable for autumn and winter! Looooove meteoric and astral blue - such a fab palette for a/w! 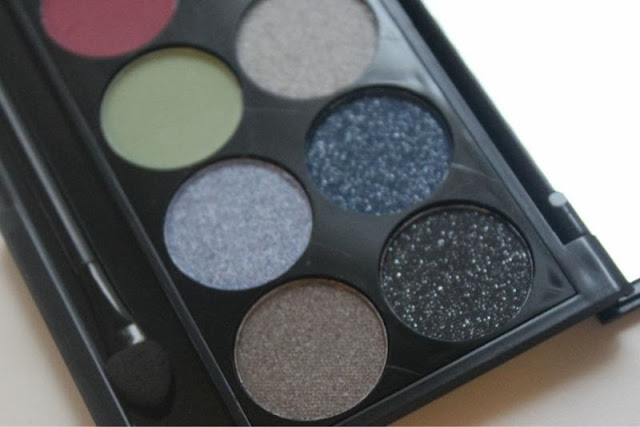 The palette looks so great, i've been dying to get my hands on a sleek palette. Don't think this one's for me though, I don't think i'd use most of the shades, but I loooove the mermaid greens in there, beautiful! It's another beautiful palette from Sleek, but I'm afraid I'll skip this one. It reminds me a lot of Sparkle2 and some colors of the Glory palette. I need to use those more often and it'll be just as pretty. P.S. The new layout is nice but I preferred the older layout. Great review! 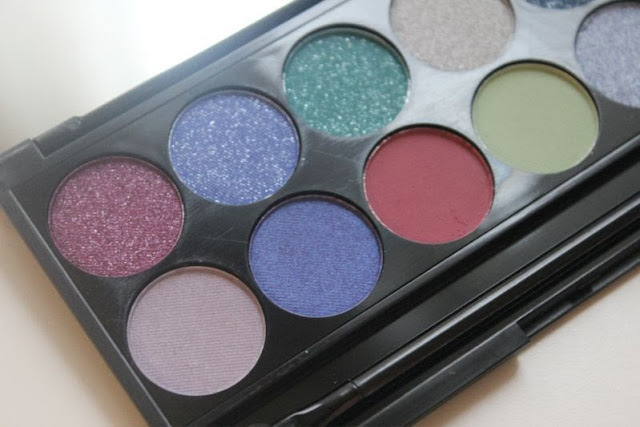 This palette looks super colorful! I am a huge Sleek fan and this one is simply gorgeous! 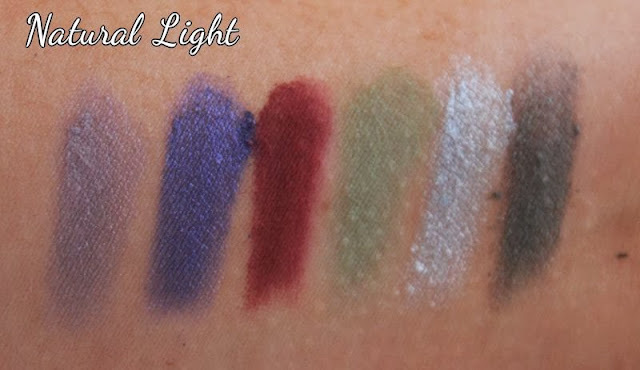 I love Sleek, and the colours are gorgeous….don't think I'd be brave enough to wear a lot of them though! What a bargain price for a great palette!